Did you know that the largest IBM chip assembly plant in the world is in Bromont, a tiny Quebec town of just 7,500 people? 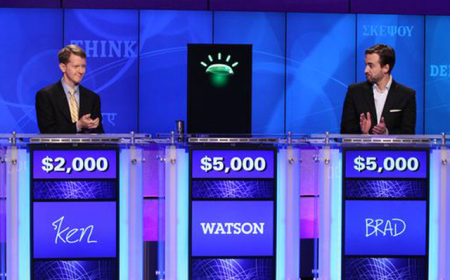 And that two world famous chips were made in Bromont: the one thatpowered the WATSON supercomputer seen onJeopardy! and the one thatpowered Spirit, an exploratory probe which landed on Mars? Quebec’s status as a microchip powerhouse officially gets even loftieras of tomorrow, when a new $218-million R&D innovation centreshowcasing Quebec’s microelectronics sector opens its doors in Bromont. Bromont, Que. – the birthplace ofthe chip that powered the Watson supercomputer (centre) – opens a newmicrochip innovation centre on Tuesday. The MiQro Innovation Collaborative Centre (MIC2) facility will befocused on microelectronics research as well as microchip testing,assembly and packaging. The centre is designed to connect over 250microelectronics researchers from both the academic and industrialworlds with the latest advances in manufacturing for the sector. About3,000 people work in the microelectronics industry in Quebec. MIC2 will feature resources to help Quebec’s smaller microelectronicsbusinesses too, said Normand Bourbonnais, the centre’s director. “SMEs will have access to skills development, resources fordeveloping strategic business plans, legal IP rights protection,guidance and funding for commercialization,” Bourbonnais said in areleased statement. The MIC2 centre already announced an order on July 9 from SPTSTechnologies to manufacture various componentss, including thermalprocessing systems. The value of that order was not disclosed. Funding for the new facility was first announced under the federalgovernment’s Knowledge Infrastructure Program back in 2009. The federaland provincial governments chipped in a combined $178 million for theproject, with the rest contributed by IBM, Dalsa Semiconductors,Universite de Sherbrooke, and other industry partners.